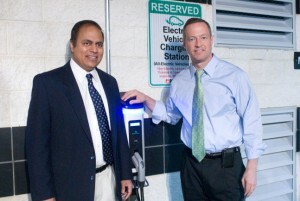 Mahi Reddy, CEO and founder of SemaConnect, and Maryland Governor Martin O’Malley celebrate the installation of eight SemaConnect electric vehicle charging stations at Baltimore/Washington International Thurgood Marshall Airport. In just a few short years, a Maryland-based startup has surged onto the national electric vehicle (EV) scene. 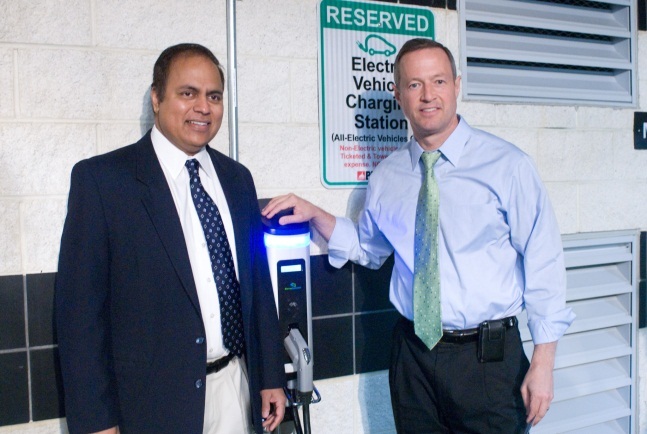 SemaConnect, founded by Annapolis-based entrepreneur Mahi Reddy, began designing and building charging stations for electric cars in 2009. Though the technology is highly sophisticated (it incorporates wide area networking, dynamic mesh networking, payment gateways, energy metering, and smart grid integration), it remains very user friendly. In partnership with the Baltimore Electric Vehicle Initiative (BEVI), SemaConnect was one of several vendors contracted to supply 60 charging stations across Maryland. Part of the Maryland Energy Administration’s Electric Vehicle Initiative Program (EVIP), the award helped SemaConnect accelerate its development and certification, and provided the impetus it needed to grow. After satisfying the Maryland Energy Administration (MEA) award, SemaConnect secured commercial orders in the private sector. As of spring 2012, SemaConnect has installed more than 400 of its ChargePro Charging stations across the United States. An additional 1,500 are slated for installation by year’s end. In Maryland, SemaConnect’s EV chargers are located at BWI, Johns Hopkins University, the Chesapeake Bay Foundation, downtown Annapolis, Linganore Winecellars, Baltimore Gas and Electric, as well as other locations. As of spring 2012, Maryland has the most electric vehicle charging stations in the mid-Atlantic, with additional installations on the horizon. A testament to its technology, growth, and future is the influx of partnerships that have been offered to SemaConnect. In 2011, the company announced the largest commercial order of EV charging stations the industry had ever seen. It deployed 1,500 of its charging stations across the U.S., including more than 400 Walgreens locations (the largest pharmacy chain in the U.S.) and Simon Properties (the largest commercial real estate owner of shopping centers in the world). SemaConnect also secured $4.2 million in funding, which further accelerates the growth of the company. Working tirelessly at the Chesapeake Innovation Center, the SemaConnect team has grown from just three people in 2011, to 10 in 2012. It plans to more than double the team to 25 in 2012, and will also move to an 8,000 square foot facility. SemaConnect is also developing a line of commercial EV charging stations, and introducing a new at-home charging station, which will be even smarter than the company’s original model. All stations and software are being built in Maryland, spurring the employment of engineers, software developers, sales teams, and administrators, which contributes to the State’s growing base of green-collar jobs. For more information about SemaConnect and its ChargePro charging stations, visit SemaConnect.com.